On June 25, 1950, North Korean forces invaded South Korea. Caught by surprise, the Republic of Korea Army was quickly overwhelmed. Seoul, only 56 km from the border, fell within three days. Like most civilians, my father's family fled south to escape the Communist forces. The routes south were choked with refugees and fleeing troops and subject to frequent bombardment from both sides. My father spoke of witnessing jets strafing and bombing civilians. He later learned that these were American warplanes acting on rumours of Communist infiltration. Such was the value of civilian lives during this bitter conflict. In the ensuing chaos, my father's 22 year old sister, Gum Sun, went missing and was presumed dead. It wasn't until the late 1970s that my father learned that his sister was alive and living in North Korea. As a medical student, she and her classmates had been abducted by North Korean forces and forced to treat combat casualties. She remained in the North following the ceasefire as a life long "guest" of the government. She died in 2008. My father, Dong Sou in the centre. His sister Gum Sun on the left. 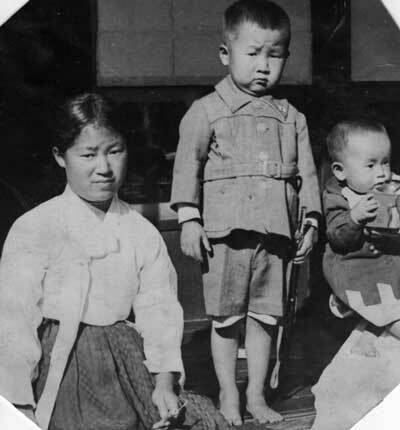 His younger brother, Dong Nun to the right. My father was also separated from his family and fled south, one step ahead of Communist forces. At 14 years of age, he was old enough to be conscripted by either side for combat or forced labour. Through guile and determination, he made his way to Busan to be reunited with his family. Even as an old man, he spoke with bitterness about giving up a prized watch, a gift from a Japanese friend, as a bribe to escape a labour gang. My father credited his survival on avoiding main roads. 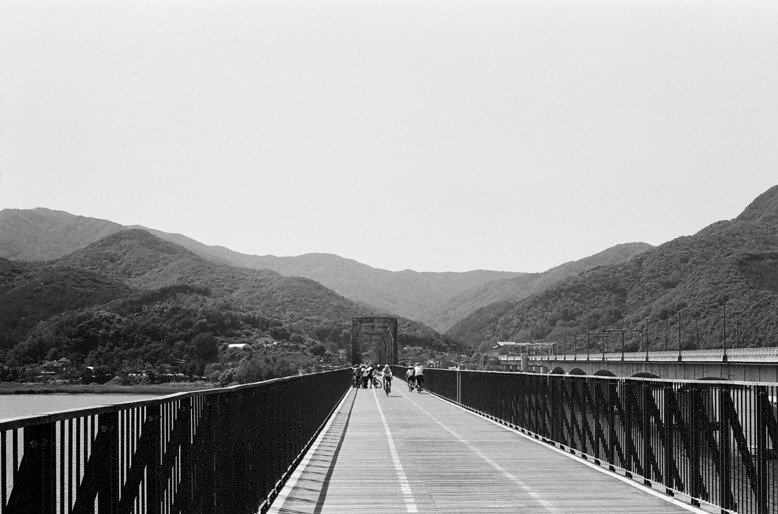 Instead, he walked on footpaths and trails that followed the Han and Nakdong Rivers to Busan. When I learned that the South Korean government built a bike trail that followed this very route, I knew that I had to ride it. 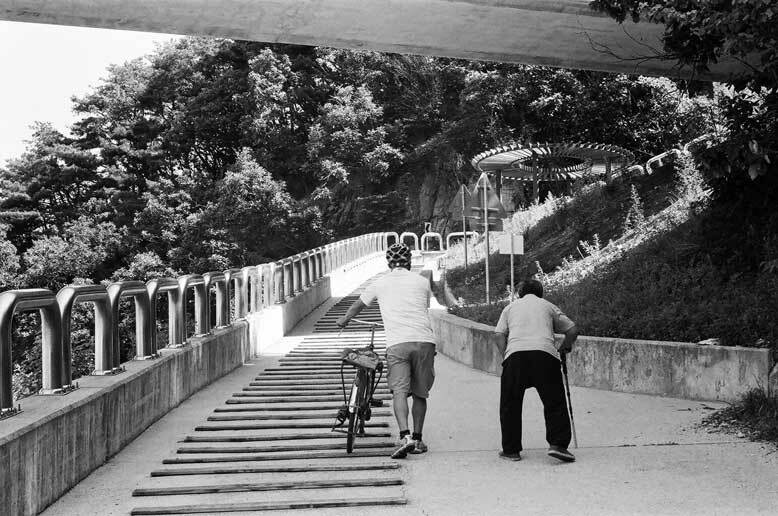 The Four Rivers Bike Path was a side benefit of the 25 billion dollar, green growth project that was declared complete in 2011 but continues to generate much controversy for its impact on the four main rivers of South Korea and the people who rely on them for transportation, irrigation and drinking water. 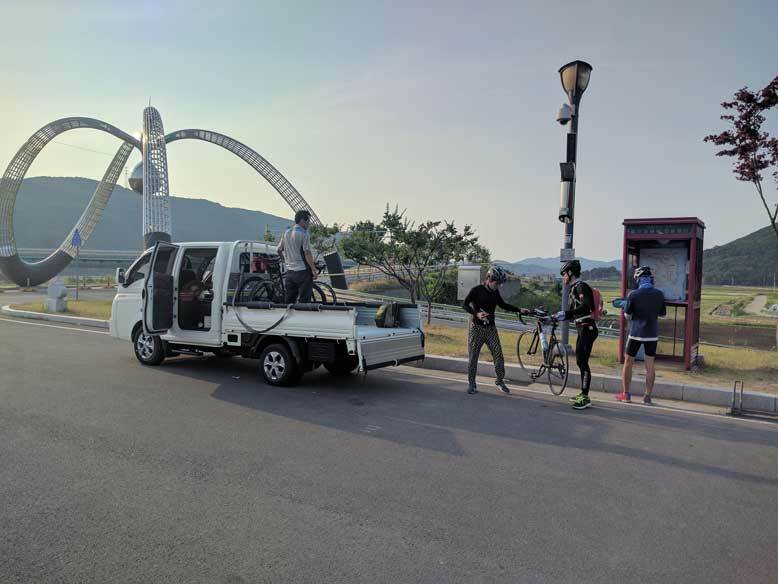 In total, 1,757 km of bicycle roads were to be built, with the highlight being a 633 km, uninterrupted trail connecting the port cities of Incheon and Busan. It was this route that my daughter and I planned to ride over 6 days. The Four Rivers Bike Path. E-Sports, K-Pop, the non-stop party of Itaewon - that’s the Korea that comes to mind for most Westerners. Yet long before Gangnam Style, Korea was known as the Land of the Morning Calm. Get on a bike, ride out of Seoul and you will see why. 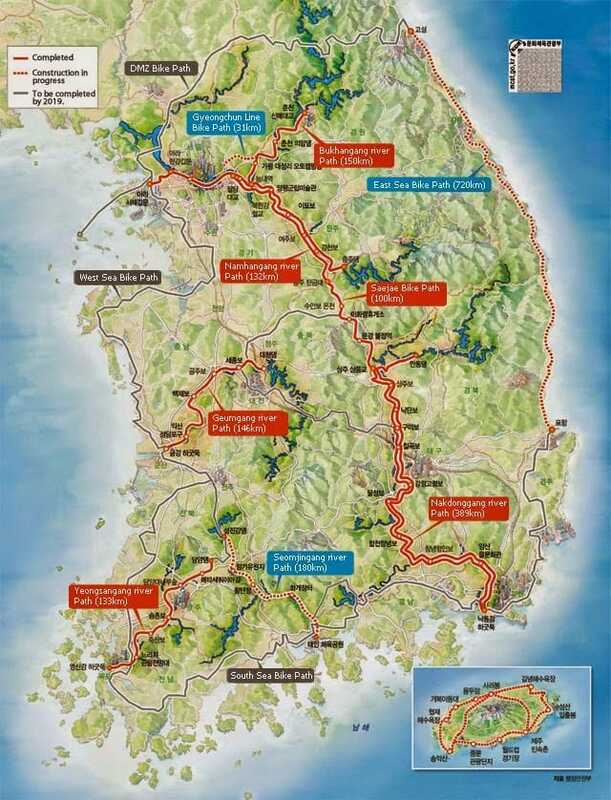 The Four Rivers Path takes you through a part of Korea that you would never see from a tour bus or speeding car. Small farming villages, rice paddies, fruit orchards, national parks - they were all enjoyed at cycling pace with frequent stops to enjoy the views. Cycling between the rice paddies. We thought frequently of my father during the ride. 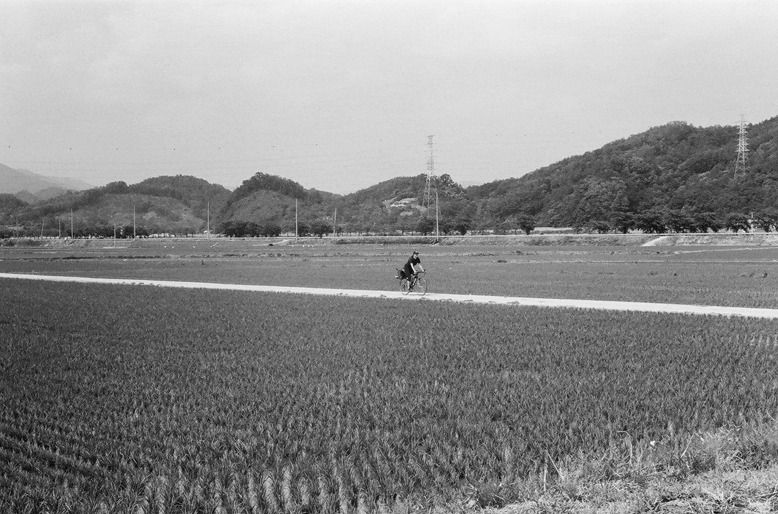 Natalie captured much of the beautiful scenery using Dong's Pentax camera, one of the only possessions he brought with him when he immigrated to Canada in 1967. The black and white images in this article were all taken with that camera. Natalie with her Grandfather's Pentax. The best part of cycle touring is meeting the local people. Cyclists tend to be met with curiousity, warmth and generosity by most locals and Korea was no exception. 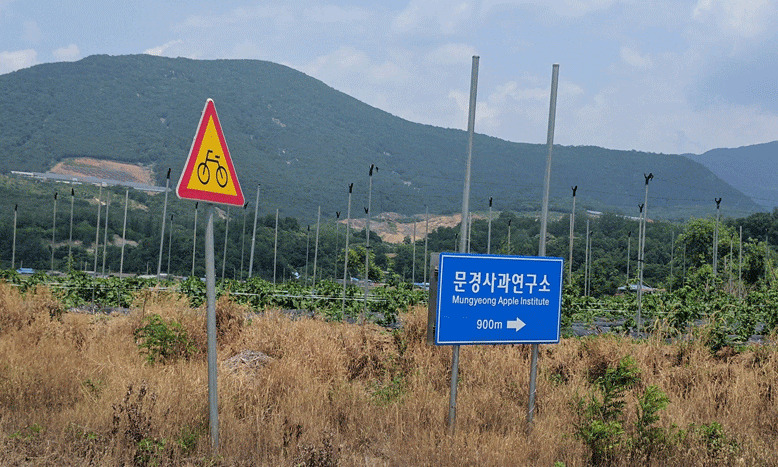 Near the town of Mungyeong, we saw a sign that read, in English, “Mungyeoung Apple Institute”. We had no idea if this was a tourist site or an educational institution but, since we both love apples, we had to check it out. When we arrived, we could see that it was a large apple processing and packing plant. And, being June, it was idle. Nonetheless, we poked around a bit until we were approached by a rather serious looking man. We fully expected to be removed from the premises but instead, he invited us to lunch. When he saw the look of surprise on my face, he simply said “진짜” or “jinjja” which means “really!”. What followed was a delicious lunch of rice, soup and various kimchis with friendly and curious Apple Institute staff. 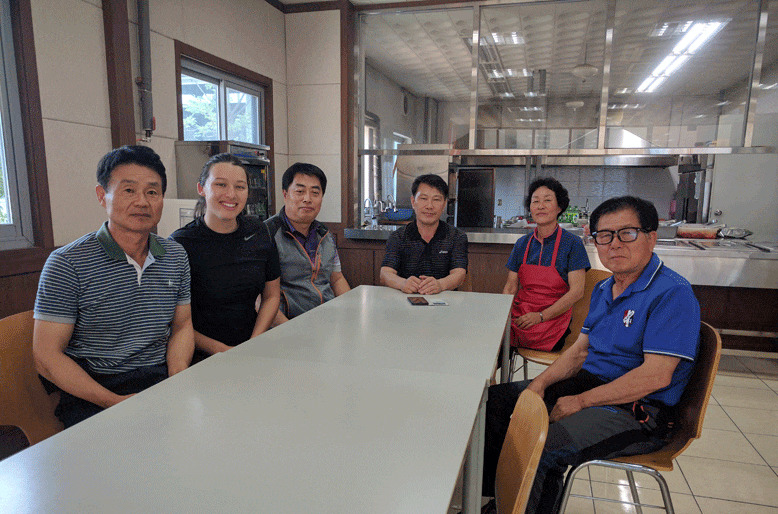 Natalie, an honourary member of the Mungyeoung Apple Institute. In Suanbo, a policeman, one of two in town, helped me look for my lost wallet. In other words, half the town's police force came out to help a dumb tourist find his wallet. We retraced my steps, conducting a thorough search of each restaurant, cafe and convenience store that I had visited the night before. He even woke up a cafe owner on his day off and reviewed CCTV footage to see if I had dropped my wallet in his shop. These guys take their lost wallets seriously. The wallet was eventually found by Natalie, wedged deeply into the recesses of a massage chair. South of the town of Yeouju, the path steepened sharply as we neared a dam. At the bottom of the hill, an old man approached on an ancient bicycle. When he got off the bike, he was unsteady on his cane and bandy legs. He smiled and spoke to me in a gentle voice. It took me a minute to register that he was asking for help up the hill. We walked together in silence, me with his bike and he with his cane. He must have been at least 80 years old. At the top of the hill, I bowed deeply and he shook my hand with hard, calloused palms. I helped him back on his bike and he rode off, much steadier on his bike than on two legs. As he cycled away, I felt a lump grow in my throat. I don't know why I suddenly felt so sentimental. Perhaps I was reminded of a grandfather I barely knew or my own father who had passed away just a few years before. Or perhaps I was thinking of my own not-too-distant future. Me and my future self. It's experiences like these that make me appreciate touring by bike. Speeding in a car or bus, you see the sights but not the people. When I tour in North America, I try not to eat in chain restaurants. Over the years, this has become more difficult as the restaurant scene has been taken over by multi-national giants. Bland heat-and-serve menus are designed to appeal to the lowest common denominator. I’m looking at you, Tim Hortons. Not so in South Korea. It seems that every small town has its own regional specialty. 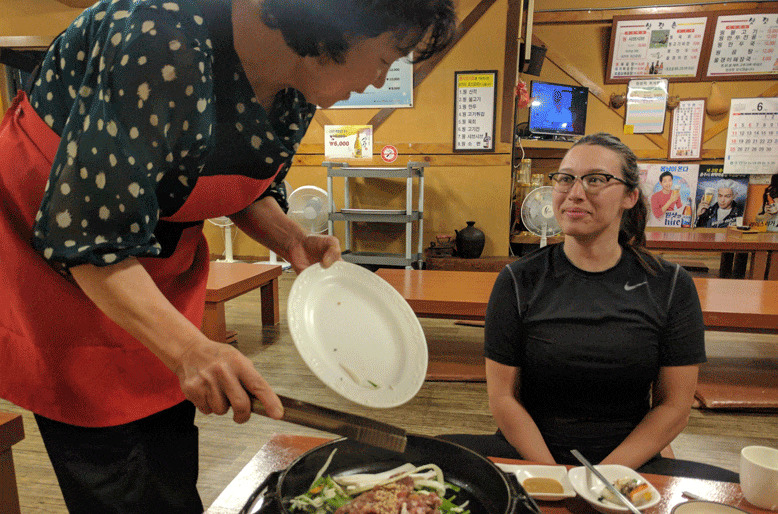 In one town, it was dakgalbi (spicy, stir-fried chicken). In another, jang uh gui (grilled freshwater eel). 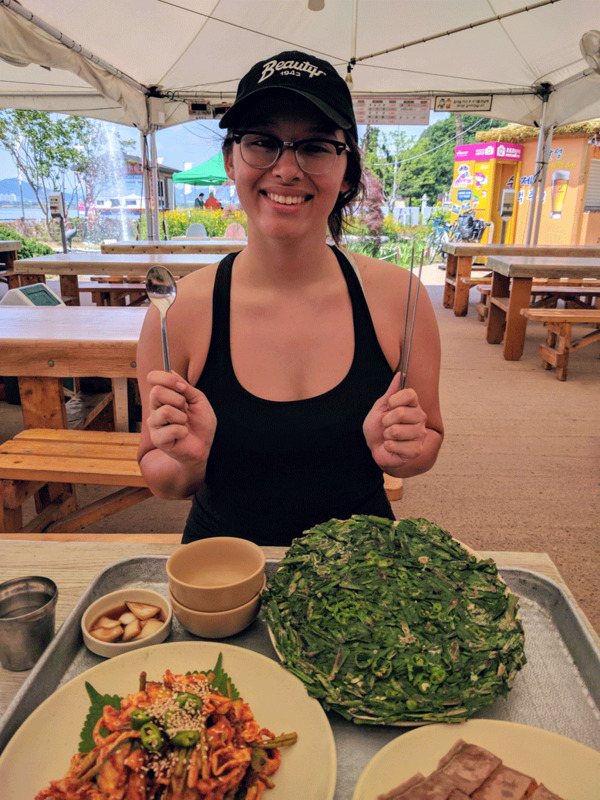 Some foods, like roasted silkworm, I detest, but I do appreciate that they are still available and that Korean cuisine has not been homogenized. Mmm...pheasant. One of the benefits of bike touring - food, lots of food. The regional dishes are not hard to figure out even if you don’t speak Korean. You’ll enter a town and every restaurant sign will depict an eel or a pig or pheasant. In one town, we found out there were 33 pheasant restaurants serving pheasant in 8 different ways. I can tell you that pheasant tartare is quite delicious - and apparently salmonella-free. Sampling the many delights of a Korean convenience store. Food choices are abundant and you rarely have to venture far from the trail to experience it. 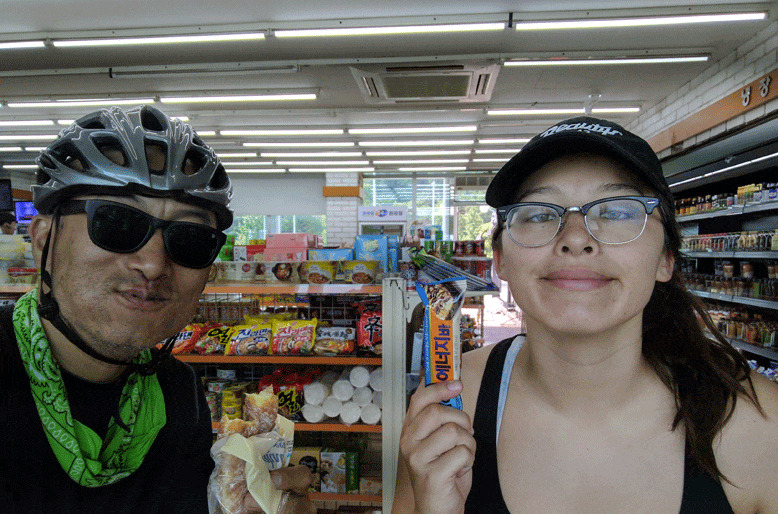 As for trail snacks and water, they were never a problem thanks to the ubiquitous Korean convenience stores like Mini Stop, GS25 and 7-11. These stores stock everything from boiled eggs to single malt scotch. 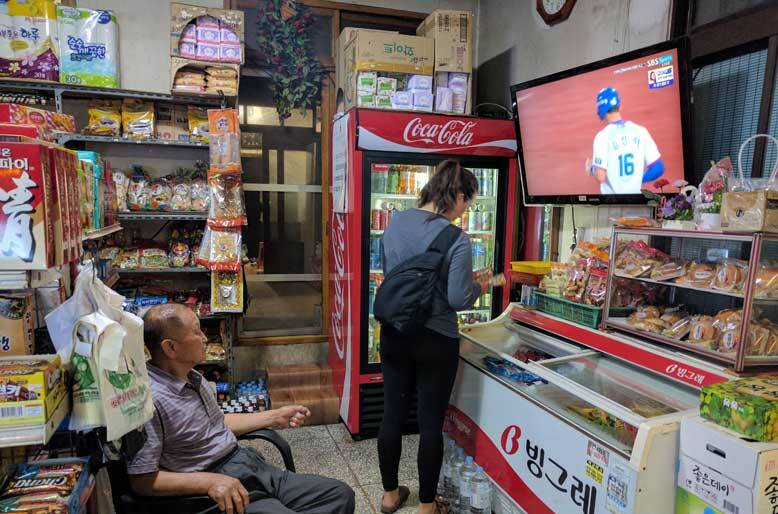 You could tour Korea dining exclusively at convenience stores. In fact, there are entire websites dedicated to Korean convenience store cuisine. And, as the name would suggest, they are pretty much everywhere in Korea. And here's the best part. When you're touring on a bike and burning 5000 calories a day, you can pretty much eat anything. Accomodations are the only area where the Path might be considered sub-par. Outside of the big cities, your choices are going to be limited to small, family run motels known as love motels, spa motels or cycle motels. If you've backpacked in Asia or South America and stayed in hostels, you're not going to have any problem. However, if you're concerned about thread-count, room service and amenities, you're going to need a bit of adjustment. All these motels are clean and safe but they do not conform to Western hotel standards. They might be considered one star at best. For instance, bed sheets and bathroom soap are sometimes not changed between guests. If that makes you squeamish, you may want to consider van shuttles to take you from the trail to a high end hotel. These shuttles are often found loitering near path checkpoints or you can simply call them for pickup. One positive aspect about touring in rural Korea is that you don't need to make prior reservations for accommodation. We just winged it and only had a problem once where we didn't find a motel until very late at night. If I were to go back, I would probably camp. Campsites were numerous along the path. Some of them had raised wooden platforms on which to pitch a tent and many even had power outlets to charge your electronics. I have nothing but good things to say about the Four Rivers Bike Path. It rivals anything I've cycled on in Europe. The path is wide, smooth and mostly car-free on dedicated bike trails. Despite the fact that Korea is a mountainous country, the builders did a remarkable job of routing the path. 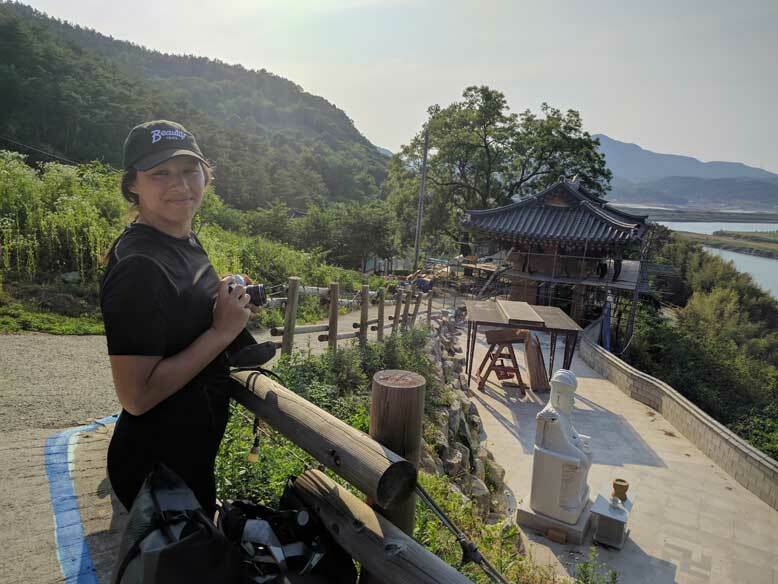 There are numerous bike-only bridges over the rivers and near Seoul, there are two bike-only tunnels that were bored through entire mountains. One of many dedicated bike bridges. Riding through a bike tunnel near Seoul from Henry Kim on Vimeo. It's mind boggling to think of the political will and vision that would have been required to get the path planned, funded and built. In my hometown of Toronto, we argue endlessly about bike lanes, a constant back and forth of car vs. bike. We even had a 3 km bike lane installed by a pro-bike city council and then removed two years later by an anti-bike council. To think that a system like Four Rivers could be built in Canada is a pipe dream. Given the quality of the path, I was surprised to see very few tourists. 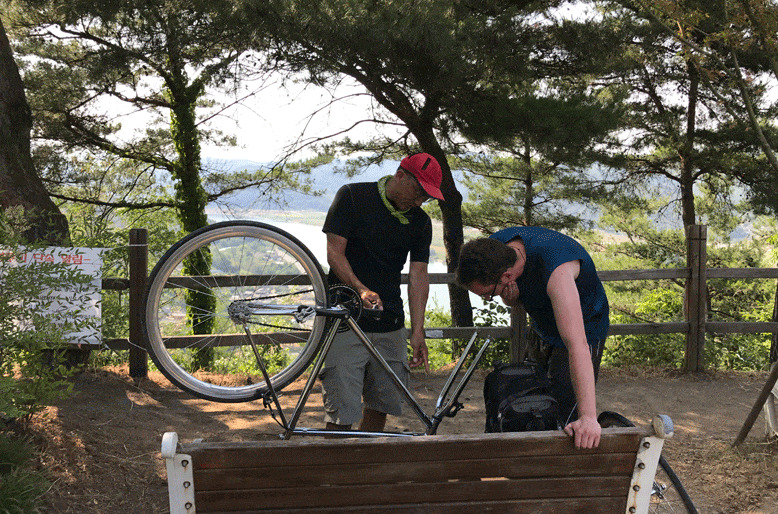 In fact, we only encountered one other foreigner during our 6 days, a German student named Stefan who was riding the entire Incheon-Seoul route on a fixie. Legs of Teutonic steel. Helping Stefan sort out a mechanical problem on his fixie. The Four Rivers Bike Path ends at a stone marker in a rather mundane parking lot in Busan. We did our high fives, then bought a bottle of makgeolli from the nearby 7-11 and made our toasts. One for my father who made it to Busan in 1950 and one for my aunt who didn't.